Now in its 28th year, AileyCamp is now underway this summer in 10 cities nationwide - inspiring students in challenging situations to discover their underlying potential, as well as the paths to set and achieve positive goals. Founded in 1989 by Alvin Ailey, the full-scholarship day camp uses the art of dance as a means to stretch the mind, body and spirit of more than 1,000 underserved students ages 11 to 14. AileyCamp is expanding to serve more than 1,000 young people in ten cities across the country. From New York all the way to the newest camp in Seattle, WA, AileyCamps will guide students to believe in their unlimited potential. 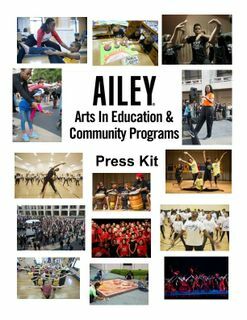 AileyCamp, the innovative full-scholarship day camp will provide life-changing and meaningful experiences to students in nine cities across the United States and welcomes the first ever AileyCamp in Baltimore, Maryland thanks to the support of Towson University. This inspiring program uses the art of dance as a means to stretch the mind, body, and spirit of approximately 900 inner-city students this summer. AileyCamp, the innovative full-scholarship day camp celebrating its 25th year, will provide life-changing and meaninful experiences to students in eight cities across the United States this summer. This inspiring program uses the art of dance as a means to stretch the mind, body, and spirit of approximately 800 inner-city students. The Ailey organization is proud to continue its mission of using dance to educate, inspire and entertain people of all ages through the implementation of 'Revelations: An Interdisciplinary Approach', in advance of Arsht Center performances led by Miami native and new Artistic Director Robert Battle.